Shopping for headphones in the $200 to $300 headphone range can be a quandary. The $200 options are mostly all fluff backed by celebrities and marketing jargon. Putting lipstick on a pig doesn't change the fact that it's still a pig, you know. The $300 crowd weeds out most of that riffraff for the more serious contenders. KEF, a British hi-fi speaker manufacturer, is now entering the market with its first pair of headphones, the M500. KEF might be able to get away with charging six figures for a set of speakers, but are these worth the $300 price tag? Like anything else in life, it's all about compromise. A $300 pair of headphones from high-end speaker makers KEF that come with a protective case, flight adapter, 6.3mm converter and two tangle-free cables. Anyone that's been searching for a pair of headphones that are comfortable enough to wear all day, aren't garish, and have minimal leakage. The M500s aren't very showy. In fact, they look pretty generic. We like that. Wrapped in synthetic leather, the featherlight aluminum frame doesn't pinch your dome the way other cans might, which explains the all-day comfort factor. Add to that the multidirectional hinge that KEF calls a "Smart Hinge" and the M500 is virtually adaptable to anyone's head. Oh, and the memory foam cups are also very excellent. As someone who wears glasses, I've had a long road to finding a pair of on-ear headphones that don't shove the stems of my spectacles into the sides of my head and to me that's where the M500s really shine. But that comfort does have its drawbacks. The M500s are perfect for use at your desk, on the couch, on the plane/train, but not so much if you're looking for something to sport that would have you bouncing around a lot. Headbangers need not apply. They're fine for walking and leisure bike rides. Skate sessions will vary. If your ears tend to sweat a lot with other on-ear or over-the-ear headphones, you'll likely be pleasantly surprised by the M500s. The memory foam cups with the synthetic leather do a great job of keeping your ears dry. There's been some discussion amongst the staff about the durability of the M500s because of the Smart Hinge. While it allows them to fold compactly and conform to just about anyone's head, an argument could be made that it's also a major point of vulnerability. Sure, if you apply enough force to anything it's going to break. But we're not really in the habit of cranking on things just to see when or where they will break. 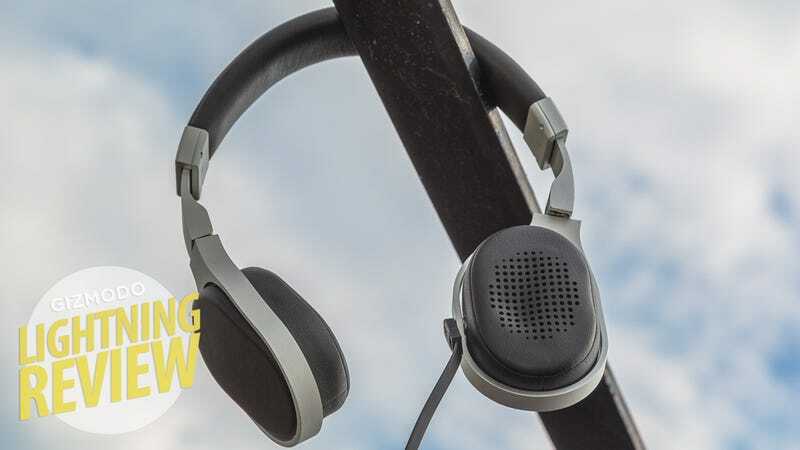 The M500s also only weigh about 0.45 pounds, which makes them feel dainty. I think they're fine. However, adjusting the headband does take a little extra effort. We've seen a lot of premium on-ear $300 headphones that promise minimal leakage, but these actually deliver on that promise. Crank up whatever Top 40 track you're into and the chance of embarrassing yourself are slim to none. The downside: They don't isolate as well as others. That's not to say you're going to hear everything going on outside of your aural experience. They're fine for plane rides, bus rides and, for the most part, NYC's subways. But the M500s are perfect for quiet and solitary environments. After the initial burn-in period, they strike a very good balance between isolation and leakage. As far as audio quality, the KEFs have a solid sound that won't disappoint anyone. They're tuned for people who like to hear the high extremes and lows in their music. The headphones have a really strong spatial image, which I'd expect more from a nice pair of speakers than a set of headphones—KEF's heritage pays off here. Overall, the high frequencies are really present and you'll hear a lot of nice detail where you otherwise wouldn't. Little guitar flourishes and background "OOOOOOOs" are pushed all the way to the front. The bass is punchy and dynamic if not exactly blaring. On A Tribe Called Quest's jazz samples, for instance, you can hear the upright bass pop, but it doesn't resonate for years like it might on more bass-focused products out there. These cans are going to lose some people in the midrange though, where things get a little muddled. When listening to old 90's alternative with guitar overdub on top of guitar overdub, you can't pick out that explosive texture, which is the reason anybody bothered to do that in the first place. The inline remote cable is, sadly, not that great. The buttons are tiny and you really have to press them down with vigor and feeling. In other words, use the tip of your finger and make full use of that nail. Also, there's no guarantee that it will work with all Android devices. Headphones and their accompanying reviews are, at this point, highly subjective. Most of us are listening to music via streaming services like Spotify. So for me this boils down to comfort and looks because my listening experience rarely exceeds 320 kbps. And when it does, the M500s don't disappoint either. If you want to spend $300 on a pair of headphones that are legitimately comfortable, don't look like a toy, and deliver a hi-fi experience, then you'd be remiss to skip over the M500s from KEF. Mario Aguilar contributed to this review.